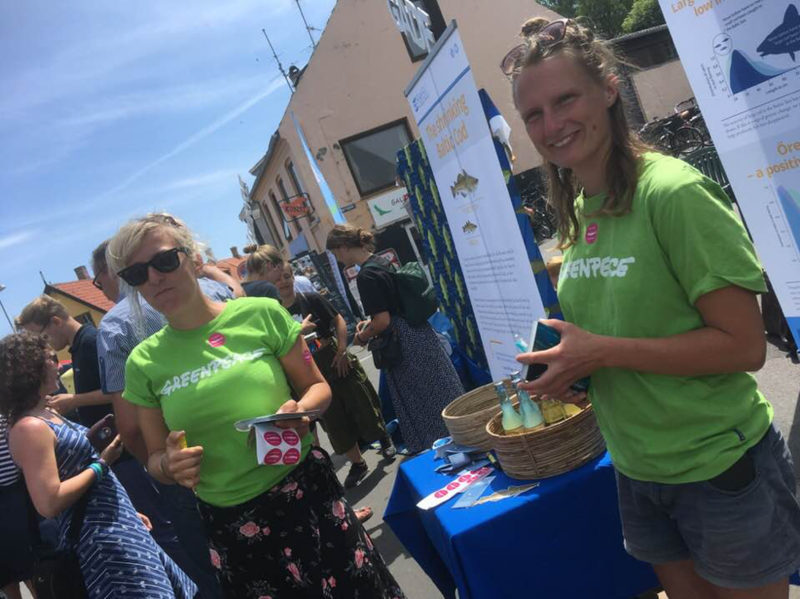 One theme stood out amongst the hundreds of conversations about the Baltic Sea while we asked people to sign postcards to the current Danish Fisheries Minister, Eva Kjer Hansen, asking her to take specific steps nationally and at EU level to urgently help the Baltic Sea. The situation for Baltic cod and in particular the fact that it has shrunk really alarmed people when they realised the magnitude of the problem. NGOs had brought to Folkemødet copies of a 20 cm cut out cardboard cod, which were offered to people as a real life representation of today’s actual size at first maturation of the Eastern Baltic cod. That’s almost half the size it was only ten years ago, and it means less eggs and smaller fillets. The commercial value is drastically reduced. Seeing the dwarf cod that now populates the waters surrounding where we were standing on Bornholm sparked a mixture of reactions; fury, despair, shock to name but a few. Mostly people wanted action and saw this environmental disaster unfolding beneath them as unacceptable and happily wrote to their Minister requesting action to solve this, including Denmark supporting fishing quotas in line with scientific advice. Still, these problems come as no surprise, the Baltic Sea is faced with huge challenges; low salinity, hypoxia, pollution, eutrophication, and high fishing pressure. 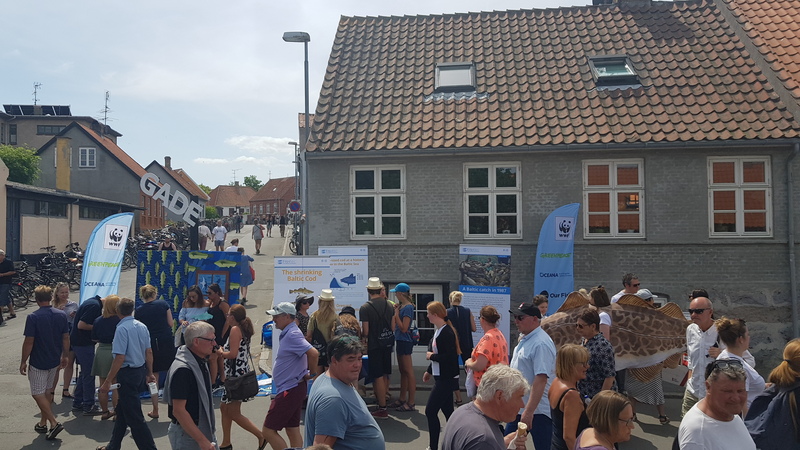 However, the level of support from people attending this year’s political event Folkemødet for efforts to ensure a healthier Baltic Sea turned out to be a pleasant surprise. The coalition of NGOs from in- and outside Denmark had found their way to the event with the ambition to raise awareness among Danish citizens and politicians about the urgent need for action to handle some of the biggest threats to these sensitive waters, their fish stocks, and in the end also to the fishing industry. Apart from attending various oceans related debates, such as on sustainable fisheries held by the food retailer COOP, and on the unique ocean area, The Sound, organised by The Danish Society for Nature Conservation; Oceana, Greenpeace, Pew, WWF and FishSec joined forces on Saturday and Sunday, and engaged with fishermen, people from all over Denmark, as well as politicians dropping by their oceans pop up stand on a busy at the epicenter of the Folkemøde to discuss the Baltic Sea and what can be done to change its story into something more positive. The joint NGO sustainable fisheries pop up event attracted a lot of people. Greenpeace volunteers Sofie Engell and Arendse Gulløv helping out at the joint NGO pop up event at Folkemødet. 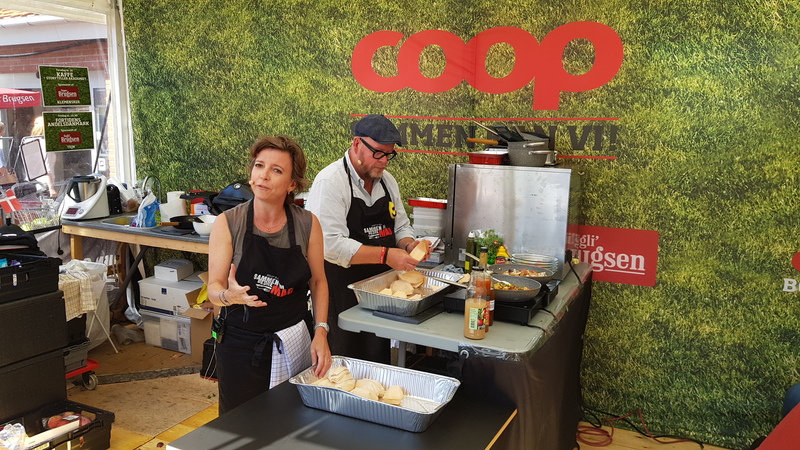 Former Danish Fisheries minister Karen Elleman cooking in the COOP tent as part of the supermarkets sustainable fisheries event. 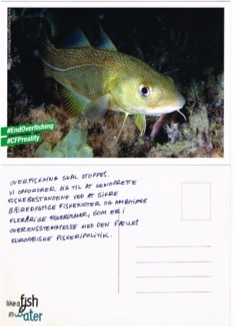 Besides great conversations with hundreds of people passing by the oceans corner, most of them also decided to engage themselves further by signing on to postcards directed at the current Danish Minister of Fishery, Eva Kjer Hansen, and asking her to take specific steps nationally and at EU level to urgently help the Baltic Sea. What seemed to trigger many people to do so, turned out to be a 20 cm cut out cardboard cod offered to people as a gift and a real life representation of today’s actual size at first maturation of the Eastern Baltic cod. That’s half the size of what it was only ten years ago, and it basically means less eggs and smaller fillets. 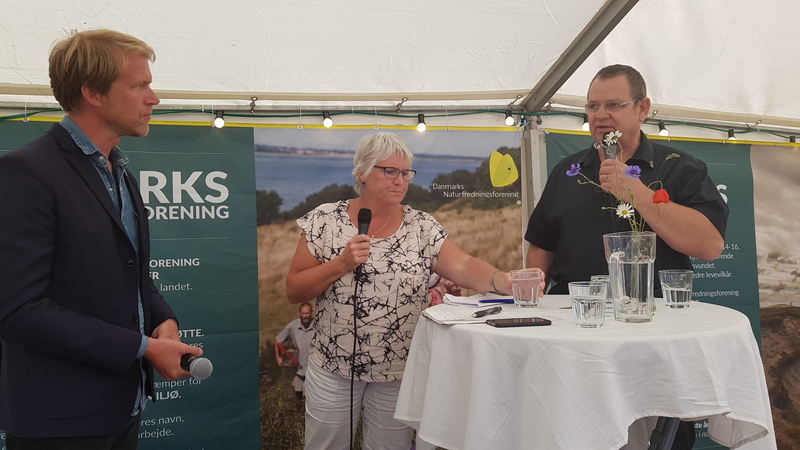 After some busy days at Folkemødet NGOs are now doing follow up work with, not only the Danish Minister of Fishery, but also other relevant decision makers inside Denmark to ensure the solid support at Bornholm for a better future of the Baltic Sea is translated into real political action. 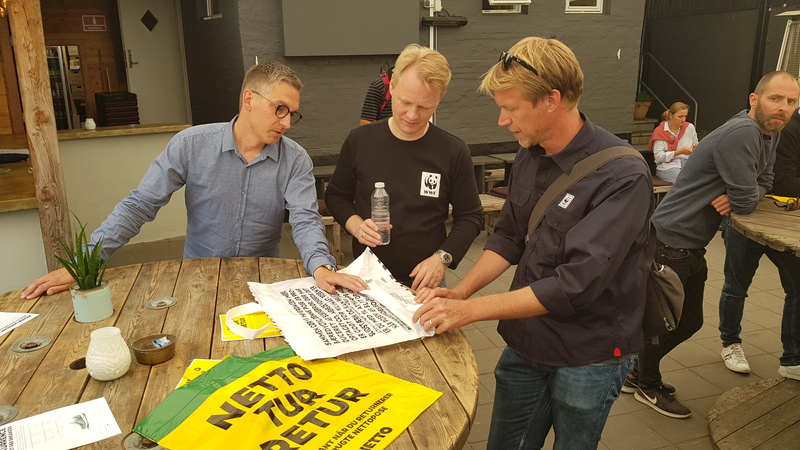 From left to right: Jonas Schrøder director, responsibility & engagement, Salling Group, Bo Øksnebjerg, CEO WWF Denmark, Thomas Kirk Sørensen, Ocean Programme Manager WWF DK, discussing alternative solutions to reduce the amount of plastic pollution at the Netto event.